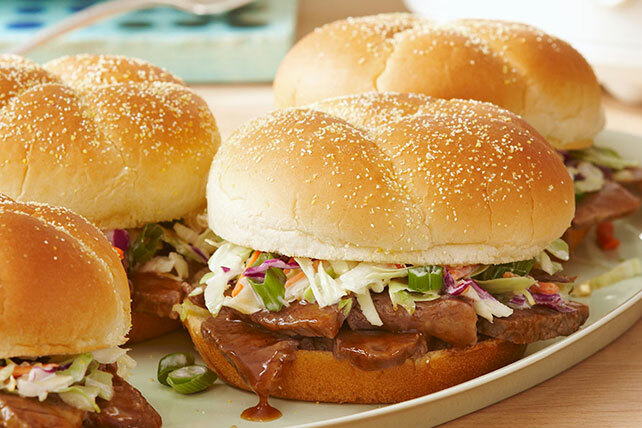 Put your slow cooker to work while you're on the job and come home to this BBQ Beef Brisket. This BBQ Beef Brisket is great on a sandwich or on its own. Place meat in slow cooker, cutting into 2 pieces if necessary to fit; top with yellow onions and barbecue sauce. Cover with lid. Cook on LOW 10 to 12 hours (or on HIGH 5 to 6 hours). Remove meat from slow cooker; cut into thin slices. Return to slow cooker; stir gently. Combine coleslaw blend, dressing and green onions. Serve meat with coleslaw and rolls on the side. Or fill rolls with meat mixture and coleslaw just before serving. Don’t forget to enjoy this delicious recipe with colorful vegetables. For extra flavor, brown meat in skillet before adding to slow cooker. Continue as directed.